A number of reports show results in a bucketized format. The buckets can be selected using on the clock icon in the upper right corner. By default we create buckets for “days”, “weeks”, “months”, “quarter” and “year”. Weeks are starting on Monday. Months are calendar months, and a week thus spans across 2 months. Relative to the current date. The report horizon then always starts at the current date of the plan. 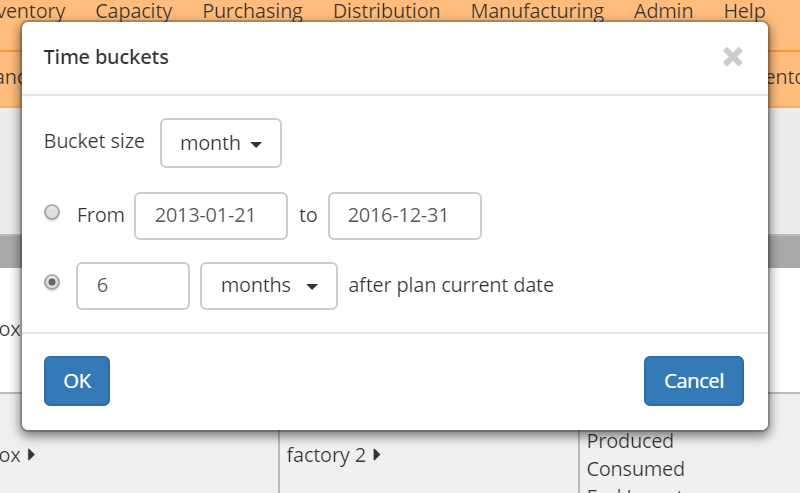 This value is specified in the Parameter table as “currentdate”, or is automatically set to the system clock if the parameter is absent or incorrectly formatted. The end date of the reporting horizon is equal to the current date plus the specified offset. When the offset is specified in weeks or months, the end date is rounded up to the start date of the following week or month. This avoids reporting on partial buckets. The settings you select are saved and will apply to all bucketized reports you open. An administrator can update the buckets by manipulating the records in the buckets and bucketdetail tables: In this way you can set up the buckets that are relevant for your organization, and also give the buckets the labels you prefer.